Starting today, there’s a new way for people to interact with your timeline app directly from Facebook: action links. These customizable links provide another way for people to do something within your app when your Open Graph stories appear in news feed, timeline, or ticker. For example, when someone checks in on foursquare and shares it on their timeline, friends can already like or comment on the resulting post through the links that appear as part of the story. 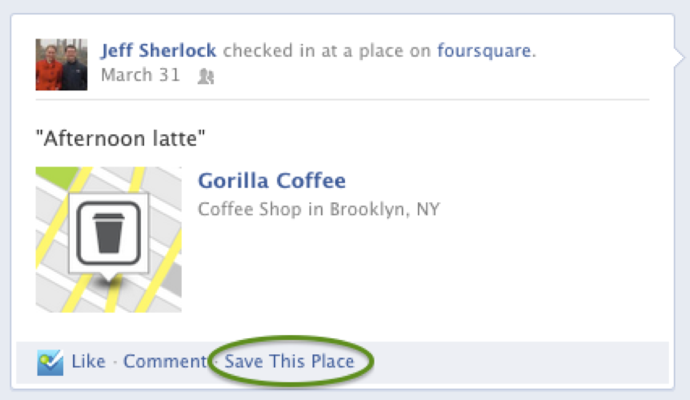 Now with action links, foursquare added another link – "Save this Place" – that enables people to save a place to their foursquare to-do list directly from Facebook. Fab.com allows people to add a product to their own Fab.com favorites with the "Fave this Product" action link. Action links tie one action to another, and can be part of any Open Graph story. Developers can designate an action link for any action they define, which will then appear throughout Facebook. See our action links documentation for more information on getting started.